Disillusionment may seem unquantifiable, but Sharek Youth Forum has found a way to measure it. The organization, based in the West Bank capital of Ramallah, found in a 2011 survey of over 1,000 West Bank youth that 62 percent of Palestinian youth don’t trust in any existing political party. But Sharek didn’t stop at releasing the statistics; in 2009 it also created a network of “shadow councils” in communities across the West Bank to help young Palestinians create an alternative for themselves. The shadow councils do not, as yet, have any legal power to govern in their towns. What they do have, though, is 9,000 members in 11 districts, unaffiliated with any political party, working week after week on youth issues often ignored by the municipal governing bodies in the Occupied Territories. He offers an example: In the village of Beit Fajjar, the municipal council decided to cut off electricity to several families’ homes due to late payment. Members of the city’s youth council, however, had a different idea about how to solve the problem. They demanded that they be put in charge of collecting the electricity bills in order to give families a chance to pay before their power is cut. The youth council held a candlelight vigil outside the mayor’s house, effectively shaming him into ordering the power turned back on. Shweiki said the youth council has been in charge of collecting the electricity fees since then, and no one’s power has been turned off. Next, the council came up with a four-stage plan to get the power turned back on. The first stage was rallying popular support using social media. Next came the vigil, its numbers swelled by the social media campaign. Third, they raised the issue with local media, making sure the area’s newspapers were all aware of the campaign. Finally, they agreed to help collect the money needed for electricity payments by going door-to-door with the electrical company’s collection agents. He said the youth council was able to convince people to pay their bills because people in the community trusted the youth council in a way they never trusted the municipal government. The relationship between youth councils and such governments, however, is not always adversarial. In fact, Sharek Youth Forum coordinates with the municipal government of each village before attempting to start a youth council there, and it works with the West Bank’s Central Election Committee to ensure the youth councils’ election bylaws are not violated. The youth councils have different election rules than the municipal governments, including stipulations that members must be between the ages of 15 and 22, and that they cannot belong to any political party. Coordination with local government has allowed one youth council member in particular to attract the attention of the international press. Sixteen-year-old Bashaer Othman, now widely known as “the world’s youngest mayor,” served as mayor of the town of Illar for two months during her summer break from school. Othman said that, although she served as mayor with the consent of the town’s municipal council, she took a very different approach to governing from that usually seen in Illar. 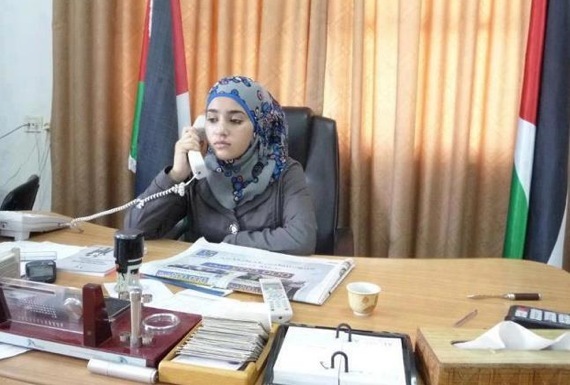 Most Palestinian youth are not interested in voting for one party or another during elections, but she was able to increase young people’s interest in the youth council by implementing social programs. For example, Othman partnered with local businesses to create an internship program for recent college graduates, which she says reduced unemployment in Illar. Othman’s appointment as mayor challenged other aspects of traditional Palestinian society as well. Creating a space for women to influence civil society is an important aspect of the youth council program. Shweiki told me that some of the youth councils initially resisted the idea of incorporating women into the councils, but Sharek worked to change their attitudes. Now, 35 percent of youth council members are female, including three youth council presidents. The idea of creating opportunities and representation for Palestinian youth takes different forms from council to council. In the village of Taybeh, for instance, one of the main concerns is education. Taybeh Youth Council coordinator Suzan Massis said that the members of her council took it upon themselves to increase opportunities for young people in Taybeh to go to college. The council organized a series of activities, including festivals and sporting events to raise money for residents to go to college. It also created a phonebook for the village — a first — by collecting all the information and designing the book themselves. All the proceeds from the sale of the book, as well as a magazine the youth council created, have gone toward tuition for students. So far, they have paid tuition for six students. The Taybeh council also holds educational camps to teach students skills outside of a conventional classroom setting. They’ve offered courses in communications, time management, and democracy and gender, as well as practical, vocational subjects such as basic electrical circuitry and HTML. Massis said the focus on personal initiatives like this is intentional. “The council doesn’t take a policy role,” she said. “It stays away from politics [to] focus on the youth. The youth [don’t] need more politics. They just want to focus on their social life.” The youth councils have so far largely escaped the notice of the Israeli occupation and have been able to work without the interference of security forces. The occupation, however, figures prominently in the lives of Palestinian youth, and council members are no exception. Despite the problems of life under occupation, the youth councils continue their work, generating democracy for disenfranchised and disillusioned young people. The model for nonviolent resistance that is taught in traditional training sessions suggests that the final stage, or the ultimate tool, to be used in a revolution is to establish parallel or alternative institutions which the people will respect and honor rather than the institutions of the oppressors and colonists. The people committed to the revolution practice loyalty to the alternative bodies rather than the institutions of the establishment. In this way people can withdrawl support and cooperation from the occupiers and oppressors. They practiced this in India, in Beit Sahour, and in the American colonies. In fact, in the American colonies, the British governors would write home bemoaning the fact that the Americans were passing their own laws, collecting their own taxes and enforcing their own codes while totally ignoring the proclamations and laws of the colonial authorities. We must divorce ourselves from the institutions that oppress us so that the powers-that-be become totally ineffective, inoperative and doomed to collapse. Power to the People!